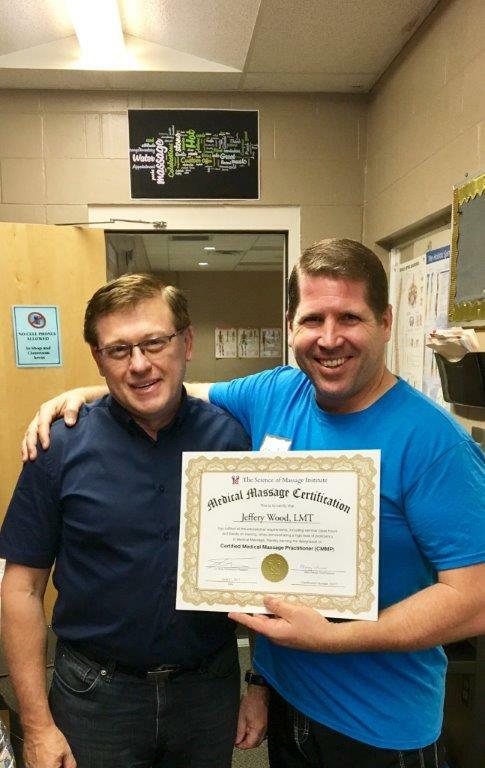 SOMI is proud to announce our latest Certified Medical Massage Practitioner (CMMP) from Inverness Florida, Jeffery Wood. In his own words he shares his amazing journey and impressive successes. Over the last 22 years I have had the opportunity to work with numerous pre-operative/post-operative patients in orthopedic rehabilitation and massage therapy settings. I have sat in on multiple surgeries with Orthopedic Surgeons and have had the opportunity to treat those patients 1-2 days after surgery. Over the years working in Outpatient Orthopedic Rehabilitation and Clinical Massage Therapy (aka Medical Massage) settings I have worked with a variety of diagnosis/orthopedic based conditions, such as Proximal Humerus Fractures, Rotator Cuff Repairs, Total Shoulder Replacements, Flexor Tendon Repairs/Extensor Tendon Repairs (In the OT Hand Therapy Department) and I have always had great success in my treatment approaches. But it was not until I became a Certified Medical Massage Practitioner that my assessment skills enhanced even more. Much of what I learned from Dr. Ross and SOMI was already a part of my Occupational Therapy background, but learning the levels of assessment for the skin, superficial fascia, myofascial, muscle layers, using Dermographism, Kibler’s 1 & 2, Dickie’s, Opposite Shift Test, took my treatments to a whole new level. Learning when and why I would use Connective Tissue Massage versus Segment Reflex Massage versus a Treatment Protocol was the last piece of the puzzle for me as a Practitioner. I am also the Lead Instructor at Withlacoochee Technical Colleges Massage Therapy Program. After receiving the credential CMMP I have embedded the principles of Dr. Ross’s teachings into my course curriculum. When my students learn how to perform massage strokes we spend weeks in the “Therapeutic Massage” (aka the blue book), and then months in the Medical Massage I & II textbooks. The students in my WTC Massage Therapy Program learn all assessments and treatment philosophies presented in those three textbooks. When students graduate from the WTC Massage Therapy Program they are primed and ready to enter the Massage Therapy Profession with a strong foundation in true science-based Medical Massage. Having added these textbooks into my classroom setting, along with understanding the principles of the textbooks, my students are entering the Massage Therapy Profession with a higher level of hands on and assessment skills. Employer are always impressed with their knowledge and clinical decision-making processes. Finally, I would like to share that I have dedicated much of my years of practice giving back to the profession and served as the AMTA Heart of Florida Unit Chairman from 2006-2009 and was elected as an AMTA Florida Delegate for 2010, traveling to the AMTA National Convention to represent the AMTA Florida Chapter at the Delegate Session. I was involved in the development of the AFMTE ELAP and the AMTA Massage Therapy Body of Knowledge projects. But since 2014 I have begun to find a way to build a better curriculum for my program and the philosophies /teachings of SOMI are what is helping my students excel at the highest clinical level.